Grand Marshal Long-time University of supporter Ken Cook will be the Grand Marshal of Saturday's Homecoming parade. Ken Cook, retired railroad executive and long-time University of Wyoming supporter, will be the Grand Marshal of the 2009 Homecoming parade, with the theme "Same Ol' Cowboys, Whole New Rodeo." He will lead the procession of floats, bands and other units through downtown Laramie, beginning at 9:30 a.m. Saturday, Oct. 10. The parade starts at 9th and Ivinson streets, goes west to 2nd Street, south on 2nd Street to Grand Avenue, then east on Grand to 12th Street. Cook's daughter, Kim Seif, will join him in the lead vehicle. 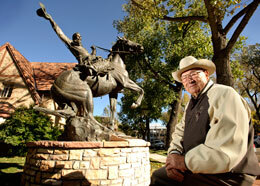 Cook was raised on an irrigated farm near Riverton and graduated from Riverton High School in 1938. He majored in animal husbandry at UW and graduated in 1942. He received an R.O.T.C. commission and served in the South Pacific during World War II. Cook held many positions during his career that began as a county agent in Montana in 1946 and ended as executive representative for Burlington Northern in 1982. He has made many contributions to UW over the years, including service on the UW College of Agriculture Advisory Council and 4-H Foundation Board of Directors; 29 years with the Cowboy Joe Club, including a term as president; and UW Alumni Association president. Cook was presented a Cowboy Joe Club White Hat Award, received the UW Medallion Service Award in 1987, served on the Hall of Fame Committee and was inducted into the UW Athletics Hall of Fame in 2001. He is a board member of the Wyoming chapter of the National Football Foundation Hall of Fame, and in 2005 received the foundation's annual award as "The Greatest University of Wyoming Football Fan." More than 70 units will participate in the parade, including Wyoming's elected state officials and congressional delegation; UW President Tom Buchanan and wife Jacque; UW Gold winners; Distinguished Alumni Marcia Dale, J. Kenneth Kennedy and Duane Woodard; and Medallion Service award recipient Jerry Schuman.